My program of structured carver education is designed to help the novice, as well as the advanced wildfowl carver, to hone skills in the techniques of wildlife wood sculpture and the principles of artful design and compisition. 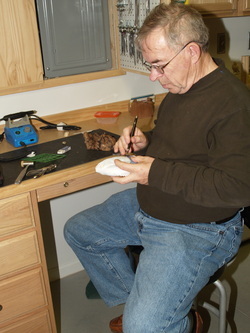 The Wildfowl Sculpture Program is for adults 16 years or older. The program advances the student at his or her own rate through all phases of the wood carving process ranging from design, planning, and on to execution. This program has been in operation since 1997. Several students have gone on to sucessfully compete in local, regional, and national wildfowl carving competitions such as the Ward Foundation World Wildfowl Carving Competition held annually in Ocean City MD. A variety of adult learning techniques are utilized in each class. All students are encouraged to select the subject of their carvings after completing a few preliminary projects such as feather carving and feather group sculpting. The student may select the tools which best suits the skill level and budget. Great care is taken to ensure student safety and to promote the use of safe workshop practices. The classroom is a modern, well lighted studio with a variety of tools and an extensive reference library for student use. The program runs continuously throughout the year. Class sizes are limited to no more than 4 students in each 2 1/2 hour session. For more information on cost and class availability go to my "Contact the Artist "page to send me your questions and concerns. It starts with a good design.